The Alchemist Brewery and Visitors Center got a new do this weekend. 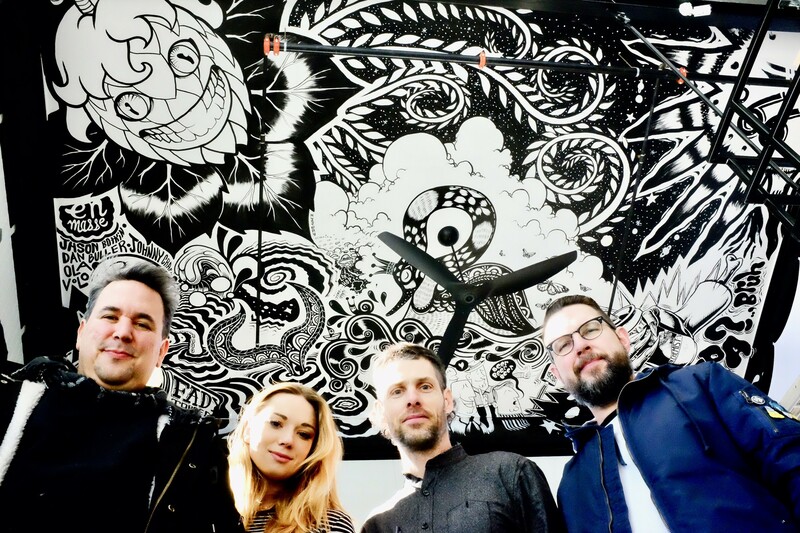 Four artists from the Montréal-based EN MASSE mural project lent their collaborative black-and-white stylings to the vaulted public entrance of the Stowe brewery. 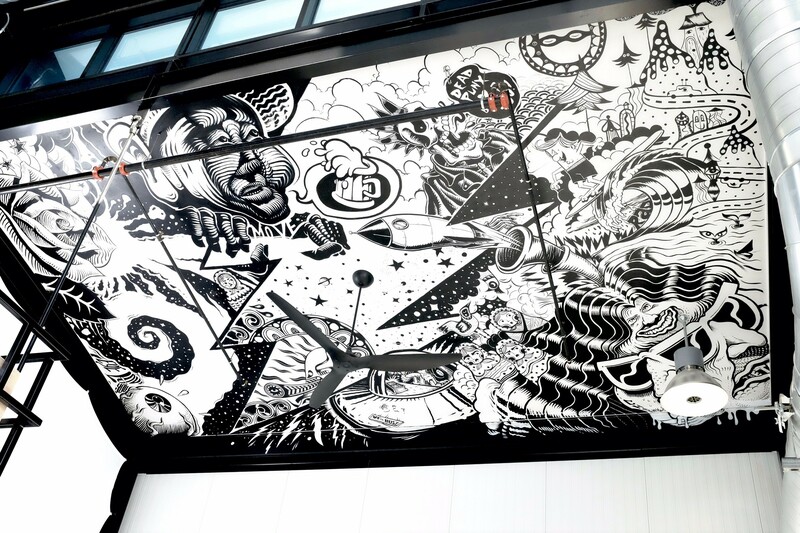 Alchemist co-founder and brewer John Kimmich first encountered EN MASSE's work in Montréal, happening upon one of their murals in a parking garage. He immediately fell for its cacophony of themes unified by stark graphics. EN MASSE, headed by Jason Botkin and Rupert Bottenberg, brings together (mostly) new artists for each project, whether a high-profile commission or a public, outdoor mural. The artists work collaboratively, each starting with a segment of wall and working outward so their designs mingle. The finished products are varied and unpredictable. Since its inception in 2009, EN MASSE has worked with more than 250 artists around the world. And it's not the group's first time in Vermont. In 2012, EN MASSE artists, led by Bottenberg, painted a large cube, subsequently suspended from the ceiling, in a now-defunct Winooski gallery space facing the traffic circle. The Alchemist's new piece — two pieces, technically, on opposite sides of the 768 square feet of ceiling space — was painted by Botkin, Ola Volo, Jonathan Bergeron and Dan Buller. It features a grinning face, a swan, an ornate rose, a rocketship and other items. Bodkin says the group doesn't usually go into a commission with a game plan, unless the client requests it. In this case, Kimmich just wanted them to do their thing. Bodkin notes that fun things happen when multiple artists work together. "It's an interesting process to watch people paint unscripted — it's contagious," he says. It seems John and Jen Kimmich have the bug. Artwork has long been essential to the popular beer brand. Alchemist art director Jess Graham says the founders hope that the brewery will be "a feast for the eyes," and aim to continually add new works to their collection. The mural joins a silo that Graham painted, work by artist Dan Blakeslee on the bright tanks, and sculptural, Dr. Seuss-like trees at the brewery's public entrance. "The intention and vision [for the building] is [for it] to become full of sculpture and art," Graham says.